GMV is taking part in the Mars Sample Return (MSR) mission, jointly run by the European Space Agency and NASA, which aims to make further headway in the exploration of Mars and bring Martian soil samples back to our planet. Running from 2020 to 2030, the international mission will comprise at least three launches from Earth and one more rocket liftoff from Mars, with the purpose of collecting Martian soil samples, storing them and bringing them back to the Earth, where a team of international scientists will perform detailed analysis. In the first part of the mission, scheduled for the first part of the decade, NASA’s Mars Rover will be exploring the planet’s surface, collecting and documenting a series of samples that will later be retrieved for return to Earth. The next steps of the overall mission will be taken by NASA’s Sample Retriever Lander, which will deploy on Mars a platform from which the Sample Fetch Rover (SFR) will head out, as part of Europe/ESA’s contribution, to retrieve the samples previously cached by NASA’s rover, compile and store them. Once the SFR has retrieved the samples it will return to the platform and load them in the NASA-developed Mars Ascent Vehicle (MAV), which will blast off from Mars to take the samples into Martian orbit inside an Orbiting Sample (OS) container. 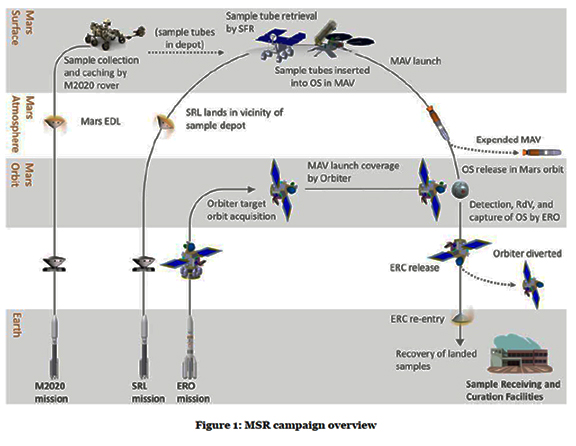 With the samples now in orbit, ESA’s Earth Return Orbiter (MSR-ERO) will now swing into action, navigating to the Martian orbit to locate and capture the small sample container (a 20-cm diameter canister) to bring the samples back to Earth. To prevent any contamination on Earth, the samples will be sealed in a biocontainer system. GMV is taking part in three activities within this mission. First, the company leads the rendezvous GNC system of the MSR-ERO, the main purpose of which is to develop and validate the image processing algorithms together with the navigation cameras that will generate measurements for estimating the OS orbit for later capture. Second, and in parallel, as part of one of the Phase A/B studies of the Earth Return Orbiter and led by Thales Alenia Italy, GMV has responsibility for guidance, navigation and control (GNC) in the search, rendezvous and capture phases of the Martian sample container. During this activity, scheduled to run for 15 months, GMV will take on analysis, design, risk control, development and verification of the rendezvous system. This key phase, centering on return of the samples from Mars, has been of critical priority for the international science community for over a decade now. Third, as part of the activities of the Sample Fetch Rover, SFR, GMV is working in the two consortiums that are currently designing two possible solutions at system level. Specifically, within the consortium primed by Airbus DS UK, GMV is concentrating on the design and development of a possible solution for the rover’s localization and mapping functions. These functions, also prototypes, will be vetted during a thoroughgoing test campaign in a first rover prototype. GMV is also participating in the consortium being led by Thales Alenia Space Italia, holding responsibility for the complete autonomous navigation system and its processing avionics. GMV’s role in this mission poses a twofold challenge. First, the GNC system, which will guide, navigate and control the MSR ERO spacecraft in the rendezvous scenario and capture the sample container. The GNC system will have to take on the challenge of defining the pathway toward the orbiting container, tracking it in a 60 km. spherical region. This will be a complex task, as the orbiting container is a football-sized object moving at several kilometers per second and less bright than many stars. GMV’s experience in the development of GNC docking and capture systems, such as those employed in missions such as the ATV vehicle, NEXT-Mars and CTSS, will be crucial to this mission’s success. For its part, the SFR’s tracking and mapping system has to rise to the challenge of combing an unknown territory in search of the samples. This system will help the rover to establish its position and find out about its nearby environment by generating local maps to choose the best route in an autonomous manner. This will also help to cut down the solar-powered rover’s energy cost and to maximize the number of samples collected per Martian day (lasting for 24 hours 39 minutes).